Bayfront Contemporary-style home offers over 3,600 square feet of living space and has been recently raised to sit above the new FEMA flood elevation. 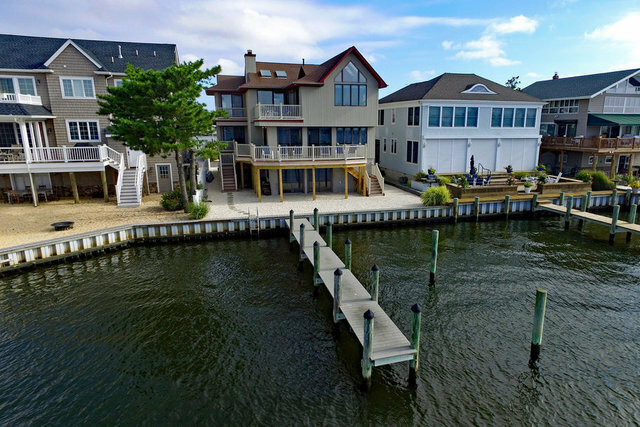 This beautifully updated home features 5 bedrooms, 3.5 baths, and an open floor plan that includes a great room with fireplace and vaulted ceiling opening to an updated kitchen with granite counters and stainless steel appliances, plus a dining area overlooking Barnegat Bay. Additional features include a master bedroom with vaulted ceiling, 2 walk-in closets, en suite bathroom and private balcony, a den/5th bedroom and laundry room. The exterior offers a Trex deck, 50 feet of vinyl bulkhead, dock, one-car garage, a huge walk-in ground level storage room, and ample off-street parking.